This compendium provides historical narratives, detailed references, citations, and commentaries on all the cities founded or refounded in Europe, The Islands, and Asia Minor during the Hellenistic period. Organized coherently in more than 180 entries, it is one of the most significant reference works in the field of Greek history to be completed in the past decade. 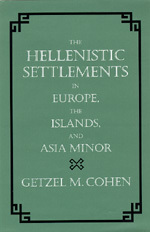 Getzel M. Cohen is Professor of Classics at the University of Cincinnati.